Rheumatoid arthritis is a painful and debilitating disease in which the body's immune system becomes dysfunctional, inappropriately attacking joint tissue and causing inflammation. A new research study is focusing on several as-yet-unsolved mysteries in the immunology of rheumatoid arthritis. Miriam Shelef, MD, PhD (pictured above), assistant professor, Rheumatology, has been awarded $1.8M over 3 years (Peer Reviewed Medical Research Program Investigator-Initiated Research Award) from the United States Department of Defense for a proposal entitled, "Peptidylarginine Deiminase 2 and Citrullination of IgG in Immunity and Rheumatoid Arthritis." Rheumatoid arthritis causes hardships for Veterans. About 1 percent of all people, including Veterans, have the disease, and treatment with currently available medications - many of which must be given as injections - is costly, averaging more than $15,000 per year per patient. The study will investigate mechanisms of rheumatoid arthritis disease initiation and progression at the molecular level. Many people with rheumatoid arthritis produce antibodies that recognize and trigger an immune system response to a normal, standard component of the immune system itself (immunoglobulin G). Additionally, rheumatoid arthritis often involves an immune reaction against certain proteins that have been modified by a process called citrullination. Diagnostic tests for rheumatoid arthritis look for these auto-antibodies, but they aren't detected in about 25 percent of people with rhematoid arthritis. No one yet knows why. "Despite decades of research on rheumatoid autoimmune antibodies, why different types of autoimmune antibodies develop and why immune tolerance is broken to generate some of them is unknown," wrote Dr. Shelef. Dr. Shelef and her team have previously shown that a protein called peptidylarginine deiminase 2 (PAD2), which catalyzes citrullination, is involved in immune system responses during rheumatoid arthritis. In mice, PAD2 mediates the severity of RA inflammatory processes and disease symptoms. In this study, scientists will conduct experiments in mice to determine how PADs impact the immune system, both during normal immune responses to a challenge (influenza vaccination) and - using special mouse strains - during establishment of rheumatoid arthritis. Another part of the study will analyze human serum samples for anti-citrullinated IgG antibodies to understand how they might be involved in development and progression of rheumatoid arthritis. "One question we are interested in is how smoking, a major problem among Veterans, may increase the citrullination of specific proteins leading to autoimmune antibodies in people who are genetically susceptible," wrote Dr. Shelef. Ultimately, scientists hope that solving some of these mysteries about the interconnection between citrullination and immune system function will lead to better tests and therapies for the disease. 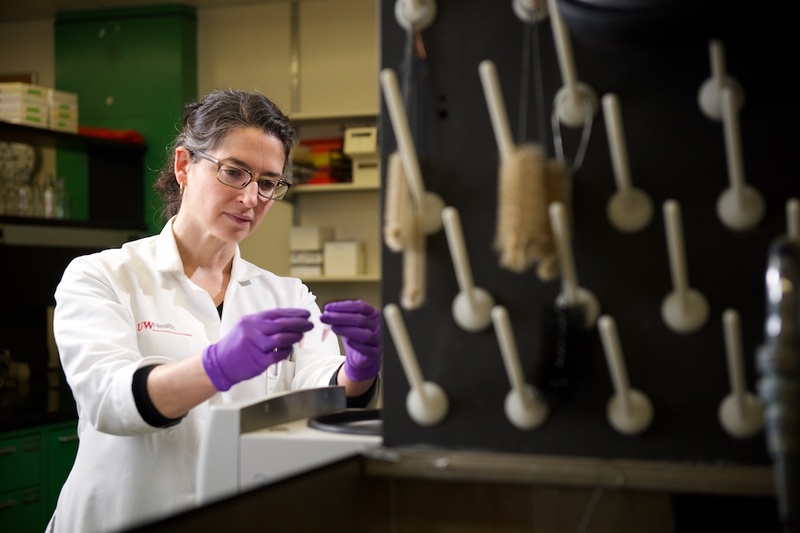 "These advances will usher in new translational opportunities to innovate diagnostics and therapeutics to allow for faster diagnosis and more effective treatment in rheumatoid arthritis," wrote Dr. Shelef.